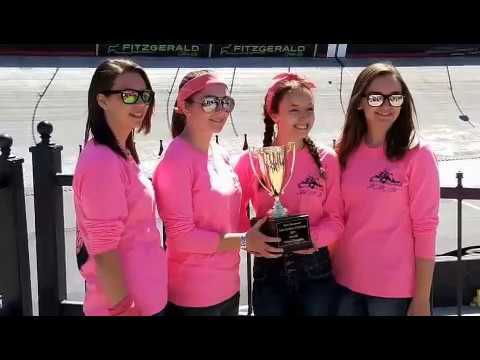 ROGERSVILLE — One year ago, tiny Clinch School — located in a rural mountainous area of Hawkins County — became a modern day "David" by slaying 19 other high school Goliaths and winning the inaugural Tennessee Solar Go-Kart Challenge at Bristol Motor Speedway. On May 7, the smallest K-12 school in Tennessee will send its Solar Go-Kart team back to BMS to defend its title, no longer the underdog, but now a target that every other high school Solar Go-Kart team in Northeast Tennessee is hoping to take down. Clinch Coach Joshua Couch said he's got the same go-kart, the same mechanic team and same four "You’ve been passed by a girl" drivers, led by Kingsport Speedway stock car racer Hannah Seals and her teammates — Katie Nichols, Taylor Kinsler and Hailie Roder. More importantly, they've still got the underdog mentality and something to prove. Clinch School is located on the north side of Clinch Mountain in a rural part of Hawkins County where the entire high school student body is only 40. In comparison, Hawkins County's two other main high schools have about 1,300 students each, and that's fairly small compared to some of the other Sullivan and Washington county schools that competed in the challenge at Bristol last year. Most of those “Goliath” schools shared a $99,000 grant from the Tennessee Department of Education that they used to build their karts for the 2017 competition. Clinch was excluded from that grant but received sponsorship from Cooper-Standard's Phipps Bend plant to pay for its go-kart. "(Last year) we were the smallest school out of 20 competing, and also we got about a month and a half later start than everybody else because we weren't included in the original grant," Couch said. "We also don't have a shop, so we're disadvantaged there. Most of the other schools have vocational programs so they have welding, and like Science Hill has a machine shop so they can do everything in-house." Couch said the secret was keeping it simple, and research. "We actually did a lot of research on the competition in Florida, and found out some stuff other teams are already using down there, so we didn't go into it blind," Couch said. "And practice. Simple stuff. One of our big things last year was our girl drivers, who are our lightest students, and kept the weight off the kart. We kept it simple, and trying to keep it light weight." This year's competition is different. Last year they were judged in four categories: Entry Video, Kart/Team Appearance, Speed Race and Endurance Race. This year its all about endurance: how far the go-kart can travel in two hours. Without giving away too many secrets, Couch said modifications this year included eliminating about 20 pounds from the go-kart. Last year in the endurance leg of the competition, they completed 25 miles in an hour and 10 minutes. Couch said he believes if they can reach the 40-mile mark on May 7 at BMS they'll be competitive. What’s different about this year’s Clinch entry? Last year, their go-kart was red, the chassis was stock right off the assembly line, and it was named "Greased Lightning". This year they stripped the go-kart down, removed all non-essential metal and painted it Army green. Clinch’s 2017 entry is now called "The War Wagon." Another big change is the tag on the rear bumper. Last year it read, "You've been passed by a girl." The 2018 rear bumper tag now reads, "You've been passed by a girl AGAIN". One of those girls, co-driver Katie Nichols, said Thursday's she's cautiously optimistic about their chances of repeating at Bristol. Last year she definitely felt like Clinch had something to prove. "At the beginning I felt like we might win, but we might not, and that's OK because we're coming up here and trying to prove to everybody we can do just as much as they can," Nichols said. "When they yelled, ‘Clinch School won’, I was like, 'OK. I didn't know we were going to be able to do that'." Nichols said she was a little worried about driving at first, especially when another competitor almost hit her. But she was encouraged by Couch, who kept telling her she was doing well, and she thinks she helped the team. Do you have a chance to repeat? Nichols: "I don't want to jinx us or anything but I think we have a good chance of winning again."